There used to be professional fishermen called “Shoku-ryoshi” in the mountain villages of Japan. They were the fishermen who caught Iwana or Yamame (Mostly Iwana in our region) by only fishing in mountain streams. We Japanese people normally call professhional fishermen “Ryoshi”. They are the fishermen in the ocean, lakes or lower part of river, but only those who did catch Iwana or Yamame by fishing with a fishing rod in mountain streams were distinguished by being called “Shoku-ryoshi”. They lived in mountain villages and went into deep mountains to fish Iwana or Yamame. 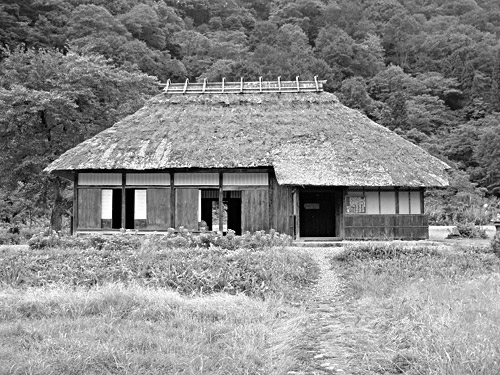 Some Shuku-ryoshi were staying in the mountains for a week or more sleeping in a coarse hut made by themselves or a rock cave. It is not certain when this work from was established, but probably hundreds of years ago, I guess from around the Edo period. And it is said that they were probably the fishermen who first invented fly fishing in the mountain streams in Japan. Naturally there was no convenient fishing gear like modern days in those eras when Shoku-ryoushi were active. There were no light weight carbon rods or strong nylon or fluorocarbon lines. 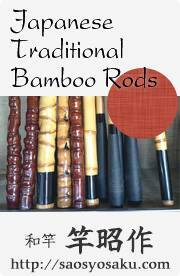 They used one piece bamboo rods made by themselves and hand- made taper lines made of horse tail hair. There was also no convenient camping gear too. They refined the necessary equipment from their daily used goods and went into the mountains with all equipment putting in the shoulder basket knitted with ivies or tree skins. Footwear used was straw sandals called “Waraji”. They used up a pair waraji in one day. So they needed to take many pair. In those days it was unable to imagine such as wading shoes. When it was raining, they wore straw rain-coat called “Mino”. For the foods, they took rice, miso, salt, some preserved meals, and they ate fish, wild vegetables, mushrooms whatever they could get in the mountains. There was no flashlight of course. They made bonfire and warm up themselves and lighted up the night. They fished during the daytime and grilled the fish caught with bonfire in the night. In most cases they entered the mountains alone. 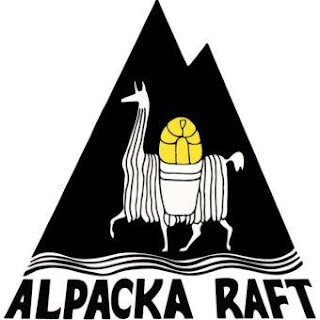 It was probably to keep the routes to their good fishing streams and fishing technics secret. Their lives of them and their families were dependent on the result of fishing. The fish Shoku-ryoshi caught were grilled unseasoned or smoked normally and sold to neighboring villages by their families or merchants of their villages. At that time, fish were valuable for mountain villagers living far away from the sea in the days when there was no refrigeration technology. Iwana or Yamame were sold at a considerably high prices compared with the present age. That was why a job called Shoku-ryoshi could be established. In addition, Iwana and Yamame, which were delicious rare mountain fish, became very popular in mountain hot-spring towns. Some Shoku-ryoshi fished Iwana or Yamame in a daytime and carried them in a same day with overnight trip to a hot spring resort. When I started keiryu fishing, I liked reading books of fishing stories or essays especially about mountain stream fishing. At that time, I was a businessman in Tokyo, and reading books was good fun in a commuter train. When I was reading those books about such mountain stream fishing, one day I found a book about Shoku-ryoshi. It was the book written about 4 Shoku-ryoshi who lived in the era of the Meiji, Taisho, and Showa (About from1900 to 1985). The book was edited by hearing stories from them about their lives and fishing. For me, who was just crazy about kebari fishing in the mountain stream, this book was a wonderfully interesting. I was really absorbed in the stories about Shoku-ryoshi, and realized they were pioneers of Japanese genryu fishing and kebari fishing. In the long history of Japan, it is worthy that Shoku-ryoushi (Professional mountain stream fisherman), was the firm job and it was continued from a pretty old era in remote mountain villages. I felt that fact was one of the most important folklore studies for Japan. Indeed, three of the four fishermen on that book were doing kebari fishing mainly and catching Iwana. Especially, I was more interested in Hirano Sokichi’s stories than other three gays. Hirano Sokichi was living in Hinoemata village, where I visited frequently for fishing. He was born in Hinoemata village in 1900. He started fishing as Shoku-ryoshi from the age of 14 years old, and in 1987 when the book was published, he was still fishing Iwana even when he was 87 years old. Starting from Oze (Now Oze area is very famous and popular National Park.) to the main stream of the Tadami River (One of the biggest mountain main streams in Main island of Japan.) and entered the headwater areas of the tributaries, he fished Iwana all the day and slept at the poor mountain hut or Iwaya (Natural rock cave.) at night. He also grilled the Iwana and dried it until very late every night. He spent 7 to 10 days in one expedition in the mountains. Fish he caught was sold as valuable protein source to the people living in the neighbor villages by his families. Since fishing can only be done from early summer to autumn, he had a few fields in the village and did hunting in the mountains from winter to spring. So Sokichi fed eight families mainly by doing Shoku-ryoshi. There were several other Shoku-ryoshi in Hinoemata village, but the notable point of Sokichi was the extent of his range of fishing. Sometimes seeking for Iwana, he climbed over 3 mountain ranges and explored into a deep mountain valley where people could not ever come over. I fished around those areas and know quite a bit of the areas. It is tremendous deep mountains and even climbing over one mountain range and going beyond is real hard work. Moreover, there was no track or footpath in the mountains. He only traced his own route. It is difficult to visit those areas even in modern times where the forest roads were improved to a certain extent. There is Mt. Komagatake altitude 2100m towering in the north of Hinoemata village. Sokichi liked a stream called “Merugamata-zawa” which is running over that mountain, but he had to climb over the mountain ranges three times to get the stream, and there was a huge snow bridge called “trimodichi-gura” hanging over the lower part of the stream. In the year when they had plenty of snow, he said that he had to go up stream while wading in the water for 300 meters under the dark snow bridge. I surely think he could catch enough Iwana even though he did not go to such a great deed outback. While reading his biography, I believe that Sokichi did not go over that outback because he wanted to fish a lot of Iwana. Sokichi thrust into deep in the mountains because he just wanted to go to the places where no one had ever been and wanted to see the sceneries of the valleys no one had seen. It must be because of his strong adventurous spirit. We also have a similar feeling when we are on a genryu fishing trip. We often feel what kind of scenery is there ahead of this bend, or what flow is there if we climb over this waterfall? I think it is one of the reasons for being fascinated by mountain stream fishing. In the story of Sokichi, he said that he did bait fishing at the beginning, but kebari fishing eventually became main method of his fishing. It was "Kebari fishing" then. Not “Tenkara fishing”. There was no word of "Tenkara Fishing"in the era in his district. Sokichi said that he was fishing while looking at the flowing kebari. It seems that his kebari fishing was just like dry fly fishing. Many of Shok-ryoshi also prefered kebari fishing. There are some reasons. Some people said because they did not have to catch and keep the baits. Some other said because it was easy to arrange the size of the fish. Others point that the result of fishing was fast. For them, Shoku-ryoshi, the streams with lots of Iwana, or good baits, good kebari, fishing methods were all very important corporate secrets. So they did not teach people how to make good kebari, line system or fishing methods, etc. It was an important secret that they talked only to a very limited person such as disciples and children. A form of transmission called "isshisoden" in Japanese. It means transmission of the secrets of tenkara fishing from father to only one child. 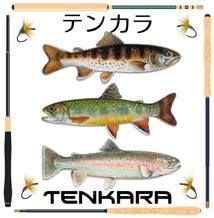 So tenkara fishing tackle system and fishing methods have never spread to general fishing people until recent days. Nowadays some famous Shoku-ryoshi have been introduced to public by books etc., and we know some famous Shoku-ryoshi like Toyama Shinaemon of Kurobe river, Yamada Kametaro of Akiyama-go, Hirano Sokichi of Hinoemata village, but there had been much more Shokuryoshi were doing their business at many places in Japan since many years ago. I think they are pioneers of genryu fishing in Japan and also kebari fishing (Tenkara fishing) definitely. 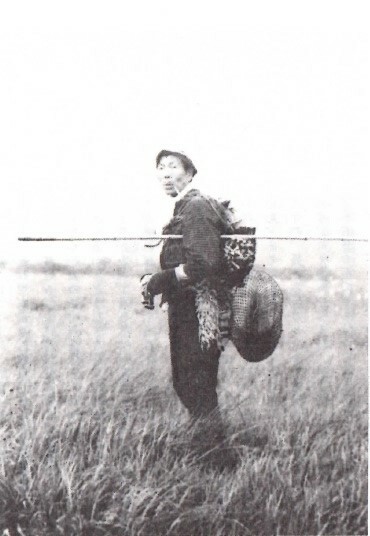 Those Shoku-ryoshi invented and developed kebari fishing over a long period of time. 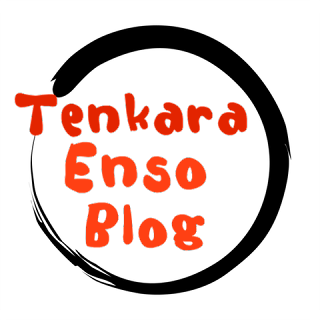 So to speak, tenkara fishing is a fishing method of professional fishermen basically. I'm not quite sure, but how about the fly fishing history that has been developed in the Western countries? Even with the same fly fishing, it seems like fly fishing has been developed more like as sport or recreation. 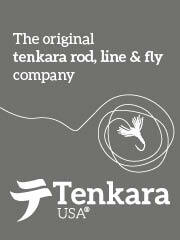 If it is correct, it would be one of the big differences between tenkara fishing and fly fishing. When I was fishing in genryu areas of Tadami River, there were 2 mountain huts along Tadami River. Those huts are called “Desakugoya” or “dezukurigoya” and people lived in the hut only during the summer as a base for field works and mountain works. One of those huts was then owned Sokichi. 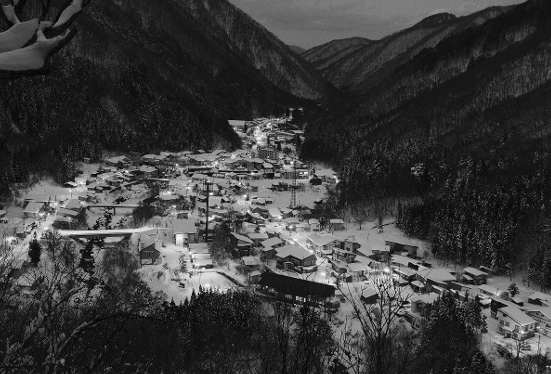 Yes, back then Sokichi was still living there by Tadami River and sometimes entered the genryu streams for fishing. I think that he was over 90 years old at that time already. I remember the hut was built with sturdy timbers and vegetables were grown in small fields in front of the hut. Sometimes smoke was rising from the chimney of the hut. One day I heard from someone living in Hinoemata village that Sokichi died. That was not the reason, but I gradually ceased to go to the Tadami River area. Sometimes, I think of what is going on for that Sokichi's hut. I wonder if someone of Sokichi's family still takes care of the hut. It has been more than ten years since Sokichi passed away. Now, there is no more real Shoku-ryoshi in Japan. They have disappeared into the flow of time.